My youngest daughter, Jenessa, is an artist. Ever since she was a little girl, she would sit down in the middle of the floor, her crayons, scissors, glitter and glue sprawled out beside her, and would begin the adventurous task of creating some new work of art. But on her 7th birthday, Jenessa received an all-time favorite gift……an Etch-a- Sketch. Life had propelled from the everyday mundane, to the extra-ordinary, in my little girl’s mind. I loved to watch Jenessa’s creations come to life on that old red Etch-a-Sketch. Many years later, one of my worship team members, who was also an artist, brought in a bright green Etch-a-Sketch, with the fabulous face of Scooby Doo etched into the toy. I was elated! About three weeks later, a small child came into the office with his mother, and when I wasn’t watching, he took that Etch-a-Sketch, and shook it hard. Utter dismay! Away went the face of my favorite cartoon character, and replaced it with complete blank shades of grey. My heart sunk. 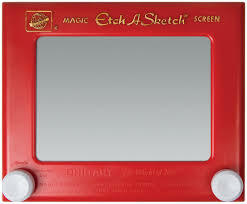 Although I didn’t say anything to the mother, I felt sure that my Etch-a-sketch would never hold the same picture again. Do you ever feel that way about life? I know I have so often. It seems to me a bit like this … .Our very being is the Etch-a-Sketch of our lives. We draw and create our hopes and dreams, the very desires of our hearts, all the way from the inner-workings and core of who we are, sketching them into our minds, only to have the world and circumstances come along and shake things up. We are left with a blank screen. Everything seems lost. Everything looks erased. This past week I experienced deep troubles that shook up the very soul of my being. I had spent hours and hours diligently reading scripture, praying and fasting, while seeking the next route for our ministry. Along came a situation and some circumstances that made me remember that old Etch-a-Sketch, as I curled up in my big green chair with my hot cup of tea, holding back the tears. My dreams seemed erased. Life had come in for a big, huge shake down, and my picture was gone. And just as surely as I thought the plans were changed, I remembered something. The God of the Universe, the very God who sent His Son for us, is the Ultimate Creator … the Artist of our lives. He is the One who turns those knobs on the board of our lives, and designs the picture on our screen. He is the One, who has created who we are, and knows the inner workings of every place and inner corner of our hearts and souls. If that same God is the Artist, why would I not relax into allowing Him to redo that picture? Perhaps it will just look even sharper, clearer, and crisper to me now. I remember now, from the days of long ago, that my dear artist friend came in to visit me, plopped down on the couch and said, “Oh, here, let me re-do that for you.” A few moments later, out came a better rendition of Scooby Doo than I remembered. It was even more suited to my taste and who I was. It was sharper, clearer, crisper and more defined now, and I breathed a sigh of relief as I displayed it on my top shelf! God is doing that for us as we allow Him to use us and have control over us. The world and circumstances may shake us to the core, until we can’t see straight, can’t see the road, can’t see the picture, but God is the Artist of who we are, and He will come in and re-create. We must remain in faith.